Before embarking on this trip, I scoured the internet to find similar itineraries that were doable. It turns out that I didn’t find any, and most of the posts actually discouraged this type of itinerary over such a short period of time. Well, we are proof that the golden triange (Las Vegas-The Grand Canyon- Disneyland California) is doable in seven nights/eight days with plenty of time left over for relaxation and sightseeing. We did this trip with kids in tow and they loved it. The first concern we had was doing Las Vegas with kids – and we did get stares from over zealous parents when we mentioned Las Vegas and kids in the same sentence. Las Vegas has become more family friendly and there were lots of activities for the kids. I would recommend staying off the strip with kids as there are plenty of hotel options that provide family-friendly accommodations in a casino free/smoke free environment. Here is how we made this trip a success with a short itinerary. We flew into Las Vegas (McCarran Airport) from Ottawa and spent the first three days there. We stayed at the Hilton Grand Vacations at the Flamingo, off the strip but still had walking access to a number of attractions and restaurants. The first 3 days were spent touring a number of attractions in Las Vegas such as the strip, the Conservatory at the Bellagio, the Venetian, and watching the fountains at the Bellagio. Alot of the popular attractions in Las Vegas are free and are very accessible. The heat in Las Vegas will make you want to stay close to a swimming pool – and we did just that. The hotel also featured a tropical landscape with waterfalls and flamingoes. Hilton Grand Vacations at the Flamingo, Las Vegas. Photo courtesy of Blair Global Media. The Bellagio Conservatory is a 14,000-square-foot floral playground that is transformed each season into a showcase of the distinctive sights and colors of spring, summer, fall and winter. Across the lobby from the front desk in the hotel is an opening through which a glass ceiling rises up 50 feet. This is the beautiful Bellagio Conservatory. The ceiling framework and beams are the sculpted green metal of oxidized copper, called verdigris, set in floral patterns. 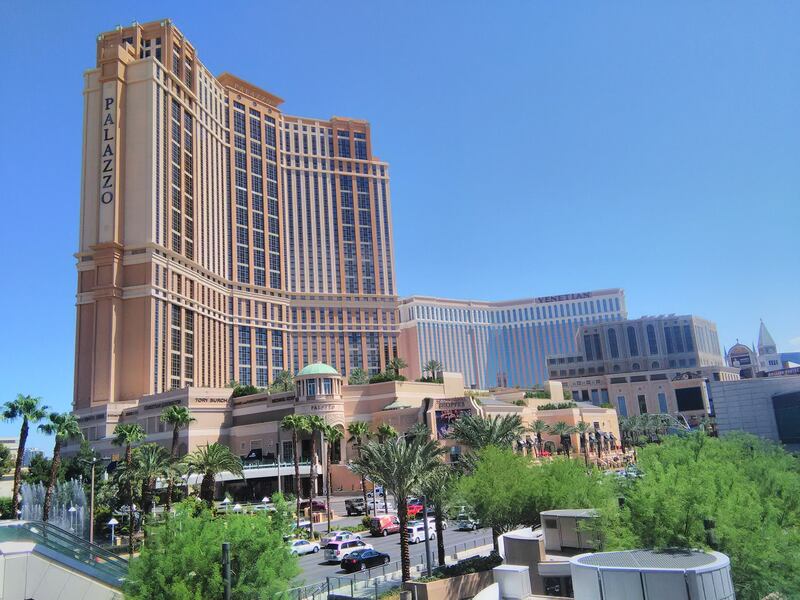 The Conservatory & Botanical Gardens’ pathways lead to Café Bellagio and a number of stores including Jean Philippe Patisserie, the first truly European-style pastry shop in Las Vegas. We stopped there twice for ice-cream before viewing the fountains at the Bellagio – and the ice-cream there is absolutely delicious! I highly recommend a visit – they also have the world’s largest chocolate fountain. The Bellagio is also the famous setting of the 2001 movie Ocean’s Eleven starring George Clooney, Brad Pitt, Matt Damon, Julia Roberts, Andy Garcia, Don Cheadle, the late Bernie Mac. Photo of the Bellagio Conservatory, courtesy of Blair Global Media. Photo courtesy of Blair Global Media. Touring the attractions and hotels on the strip was an experience unto itself. The major hotels in Las Vegas are really extravagant – the lobbies are soaring with waterfalls and shopping promenades (e.g. Forum shops at Ceasar’s Palace and the Grand Canal shops to name a few). We toured the lobbies of the major five hotels (The Bellagio, the Wynn, The Palazzo/Venetian and Ceasar’s Palace – and each one was an attraction in and of itself – with ostentatious floral displays, topiaries, lagoons, five story water falls, gondola rides and 50 ft. volcanoes that regularly erupt! Las Vegas may well be the only city in the world where the skyline is made up of other cities and even countries – there’s Egypt, New York, Paris, Venice, the Roman Empire, and all are represented in the facades of extraordinary hotel-resort complexes and behemoths with over 3,000 rooms. Their themes span the globe and the ages – there’s the Eiffel Tower at the Paris hotel, the Sphinx at Luxor hotel and Gondola rides at the Venetian. For strip-hopping, we took the monorail as a reprieve from walking – and it was a welcome relief from the scorching heat. For food in Las Vegas – plan on spending about $30-$50 per person, per day for food. If you’re truly frugal – it can be done on $35 per day. The buffets at the major hotels can be very expensive for large families – we didn’t attempt any – one buffet meal could easily cost a family of five $500. Instead, we did a combination of breakfast/lunch at simple restaurants and then splurged a bit on dinner. In terms of entertainment, the superstars of the music world have put down roots in Las Vegas – there’s Lady Gaga, Jennifer Lopez, Celine Dion, and Madonna. Entertainment options in Las Vegas are too many to mention – from Cirque du Soleil to comedy shows. The Venetian. Photo courtesy of Blair Global Media. Photo: View of New York, New York Hotel, and the fountains, courtesy of Blair Global Media. After 3 days of sensory overload, we rented a car and drove from Las Vegas to the Hoover dam – only 30 miles outside of the city – and then on to the Grand Canyon. We spent around $30 per day for a rental car and kept it for the rest of the trip. It took us just under an hour to get to the Hoover dam from Las Vegas. There was hardly any traffic – just a small bottle neck as we approached the dam and that’s it! It was a smooth drive down to the Hoover Dam with little to no hassle – the kids hardly even noticed. The Hoover Dam is an engineering marvel (called the Eighth wonder of the World) and my oldest son was in total awe of the mechanics of dam construction – he now wants to be an engineer – go figure! We didn’t spend long at the Hoover Dam because we wanted to spend the better part of the day at the Grand Canyon. It took 1.5 hours to get to the Grand Canyon from the Hoover Dam – and again very little traffic and no delays. We visited the West Rim of the Canyon – the nearest point to Las Vegas. The Grand Canyon West is about 118 miles from Las Vegas versus almost 350 miles to the Grand Canyon South Rim. Most visitors to the West Rim only spend roughly 3-4 hours there. Tours that include group transportation are usually most convenient since the area is in a remote wilderness region. Photo of the Hoover Dam courtesy of Blair Global Media. The Grand Canyon West is owned by the Hualapai Indian Tribe (pronounced “Wall-uh-pie”). The Hualapai Reservation, established in 1883 comprises about 1 million acres that extends from the west corridor of the Grand Canyon to the small town of Peach Springs, Arizona located on Historic Route 66. The Skywalk is by far the premier attraction here. The horseshoe walk is a glass bridge that juts-out 70 feet into open space from the canyon’s edge. Visitors have nothing but reinforced glass under their feet suspended 4,000 feet above the canyon floor. The bridge is 10 feet wide with 6 foot high glass railing walls. Photo of the Grand Canyon, West Rim, courtesy of Blair Global Media. After our visit to the Grand Canyon we returned to Las Vegas to get some well needed rest to head out early in the morning to Disneyland California. It only made sense to do this since the route from Las Vegas to Anaheim, California was shorter from Las Vegas than the Grand Canyon. We also found that with the kids – breaking up the trip into smaller digestive mini-trips was more palatable than one road trip that was just too long. It took us 4.5 hours to drive from Las Vegas to Anaheim, and I cant say it was a very scenic route – not until we got into the city. We got out of Las Vegas as early in the morning as we could to avoid traffic delays. Disneyland is 264 miles, (or 424 kilometers), from Las Vegas, when starting off in the center of the Las Vegas Strip at Caesars Palace. Its about the same time span driving from Ottawa to Toronto – and for those of us who frequent that route – that’s very doable for a short two-day weekend trip. We were able to spend two full days at Disneyland and even toured other sites in California on our drive back to Las Vegas, such as the Hollywood Walk of Fame and the Hollywood sign. We stayed at the Anaheim Courtyard Theme Park Entrance hotel. It was very close to the park – we walked to the park both days and for a family of five provided tremendous value. The hotel is new so the rooms were clean and some rooms provided bunk beds for the kids, providing additional sleeping quarters. The hotel also had a lovely water park that was free for hotel guests that the kids loved after spending the day at Disneyland. View of the Waterpark at the Anaheim Courtyard Theme Park Entrance, from our hotel room. Photo: Blair Global Media. We’ve been to Disney World in Orlando many times and in comparison, Disneyland is much smaller. The two parks are completely doable in two days. Staying onsite at one of the Disney hotels wasn’t a major consideration because we didn’t need to get to the parks as soon as the gates opened because of the amount of ground we needed to cover. The only ride where we encountered very long lines was the Radiator Springs Racers ride in Disneyland – and we were still able to do the ride twice in one day. Similarly, we were able to do several rides over and over again, back-to-back, because of the small size of the park. The Grizzly River ride had long lines but nothing compared to Disney World. Tomorrowland Disneyland California. Photo courtesy of Blair Global Media. Cozy Cone Motel restaurant. Photo courtesy of Blair Global Media. We drove back to Las Vegas the following morning and had a smooth drive back. We had time to decompress and prepare to fly back to Ottawa the following morning. All in all we had a good trip – and felt like we really maximised our eight-day trip.